Lock in a great price for Hotel Bonne Auberge (Adults Only) – rated 8.1 by recent guests! 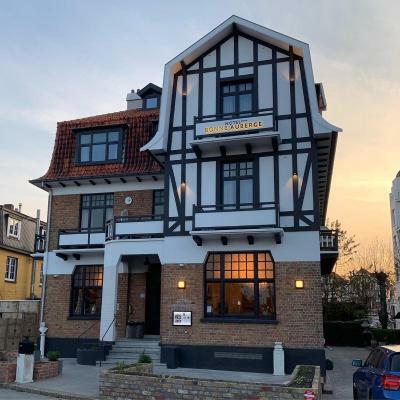 This characteristic hotel offers accommodations in the heart of De Haan and is completely renovated in 2019. Benefit from free on-site parking and sit out on the terrace. Hotel Bonne Auberge is located in the old town center, near the beach. Each room has its own atmosphere and is named after a North Sea Shell. When would you like to stay at Hotel Bonne Auberge (Adults Only)? House Rules Hotel Bonne Auberge (Adults Only) takes special requests – add in the next step! Hotel Bonne Auberge (Adults Only) accepts these cards and reserves the right to temporarily hold an amount prior to arrival. Hotel has rooms with double beds and twin beds. Please verify upon reservation if the requested bed type is still available. Please inform Hotel Bonne Auberge (Adults Only) of your expected arrival time in advance. You can use the Special Requests box when booking, or contact the property directly using the contact details in your confirmation.